Personalize your Extractigator with raised lettering! Our never ending quality quest …. 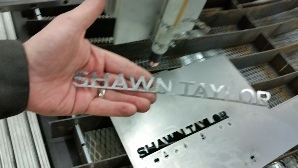 We take your personalized message (up to 20 Characters) and Cut the letters out with our in-house CNC Plasma table. Then we use the Tig welding process to permanently bond the cut out letters to your Extractigator handle. The result is clean, professional and non-intrusive. Great for various organizations from conservation to Parks Departments that lend out tools - or just for your own personal touch to the quality tool you purchase! Note: Since this is a custom item, the process may delay shipping by 1 - 2 weeks depending on seasonal demand.